Until 1796 the area belonged to the Commonwealth of Massachusetts. That year four men - including James Rangeley Sr. of Philadelphia - purchased nearly 31,000 acres between the Kennebec River and New Hampshire for timber and mineral rights. The area was inhabited by five different Indian tribes at the time - the St. Francis and the Abnacki, thought to be the most predominant. Although privately owned, the Indians had the land exclusively to themselves until 1810. It was not until a few years later that Rangeley Lake would see any permanent "white man" settlement. The first family was from Avon - Luther Hoar, his wife, Eunice, and eight children, including 7 week-old baby Eunice. In late March of 1817, they trekked 26 miles on foot through the woods and snow to Rangeley Lake with all of their possesions on two "moose sleds" and the baby strapped into a large wooden bread mixing trough. They reportedly survived on fish and game and lived quite "primitively". The following year, two other families settled near the lake, and thus began the "Lake Settlement." Upon his father's death, James Rangeley, Jr. inherited his share of land in Maine and proceeded to buy out the other partners. In 1825, James Jr., later known as Squire Rangeley and his family traveled the single horse trail from Madrid, intent upon making this wild place their home. About 12 years later the area was renamed "Rangeley" on a new state map. (Maine became a state in 1820.) By 1840 the population had grown to 39 families. Rangeley was a small but thriving farming community with a sideline trade in lumber...yet there was a spot at the confluence of the Rangeley and Kennebago Rivers, called Indian Rock, where Brook Trout weighing in excess of eight pounds could be caught. Sport fishermen from Providence, Rhode Island and New York City discovered this spot in the early 1840s, but it wasn't until the 1860s that Rangeley's reputation as a fisherman's paradise really took hold. For many years the local farmers had fished for sustenance, and therefore, they instinctiveley knew where the best fish could be landed. 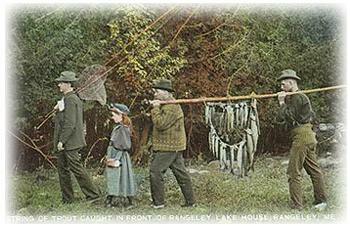 As the news spread to the cities, bringing greater numbers of fishing enthusiasts to the area, many of Rangeley's enterprising settlers became guides while others built public houses, sporting camps (usually a cluster of cabins serviced by a main lodge), cabins and even hotels to accommodate their guests. Across from the famed Indian Rock, a group of the earliest sport fishermen formed the Oquossoc Angling Association, a private club of individual cabins with a main lodge for dining. By now, the later half of the 19th century, Rangeley was attracting sizeable publicity. An enticing 15 page article on the region was published by Harper's New Monthly Magazine in 1877. Soon after, the railroads published their own regional travel guide to attract visitors. Cornelia "Flyrod" Crosby was probably one of the area's most famous publicists. Her articles and fly casting demonstrations at eastern sporting shows had a major impact on drawing visitors and sportsmen to the Rangeley region. By 1900, fishing guides in the area numbered 200. One of the most famous guides was Herbie Welch, who arrived at Haines Landing in 1903. He was a champion fly-caster and served as a guide to Rangeley's distinguished visitors, including former president Herbert Hoover. Another locally famous person was Carrie Stevens, who lived at Upper Dam in the 1920s -1940s and originated and tied approximately 100 fly patterns, with the popular Gray Ghost Streamer being one of these. During this period, some of the well known resorts included Camp Bemis on Mooselookmeguntic Lake, Mountain View House, Mooselookmeguntic House, Rangeley Lake House, The Barker, Bald Mountain Camps, The Birches on Students Island in Mooselookmeguntic Lake and Grant's Kennebago Camps. Growth in Rangeley was primarily influenced by tourism. By 1909 its population had grown to nearly 1,300 up from 238 in 1860. In addition to the numerous public accommodations were substantial private camps owned by wealthy, influential families from Philadelphia, New York City and Boston. Locals and visitors alike were serviced by a bank, library, churches, a school, public water, locally generated electricity, grocery stores, a hardware store and pharmacy - all evidence that Rangeley had come a long way from the farming community its Squire had left some 70 years before. The late '20s and '30s were known as the "Golden Age" for hotels and the larger sporting camps. Families escaped the heat and dirt of the big cities to "summer" at their favorite resort in Rangeley, a tradition which often spanned several generations. 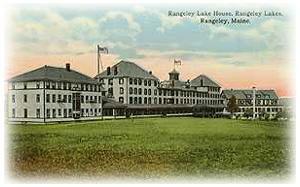 Rangeley eagerly met its visitors' sophistication by providing chefs, orchestras, ballroom dancing and silent movies. Simultaneously, the railroads obliged by extending their lines to convenient in-town ports and a bus service transported vacationers from Farmington and Phillips and beginning in 1934 one could even arrive via seaplane. Unfortunately, World War II would change Rangeley's course of history by not only taking its young men, but also by halting the summer vacations of many who were devoting their days to less frivolous activities to aid the war effort. With the end of the war came a noticeable change in previous trends. Reportedly, the "vacationing public was becoming more mobile and would no longer be content to stay in one place for an extended period." Larger hotels quickly lost popularity to motels, and the cabins of public sporting camps and cottage communities were sold off to individual owners for use as summer homes. By 1958, the famed and historic Rangeley Lake House was razed. Other resorts were destroyed by fire and consequently never rebuilt, thus ending Rangeley's prosperous hotel era. Although the style of vacations in Rangeley has changed, the region is still a highly popular summer resort and summer home destination. Many of the children and grandchildren of visitors during Rangeley's Golden Age own cabins or camps that were once part of the many resorts dotting the shores of Mooselookmeguntic, Rangeley, Saddleback Lake, Quimby Pond, Kennebago Lake and other bodies of water. Still in operation today are three historic sporting camps now run as public resorts for fisherman and family vacationers: Bosebuck Mountain Camps on Aziscoos Lake, Grant's Kennebago Camps and Bald Mountain Camps on Mooselookmeguntic. The renown Oquossoc Angling Association is still thriving, and the centerpiece of downtown Rangeley, the 91-year-old, three story Rangeley Inn (earlier called the Rangeley Tavern), continues to stand as a proud monument to the Hotel Era. Today the Inn offers all of the modern conveniences and amenities, yet its architecture still draws vacationers back to an earlier, grander time. Scattered remnants still remain of the Indian path, the buckboard road and the railroad passage leading to the chain of lakes...and although a thriving four-season resort community, one doesn't have to walk far into the woods and mountains to experience the area's wilderness and, in a sense, walk back in time. Click here to see more historical photos! &COPY; 2001-2003 Pine Tree Publishing. All rights reserved.